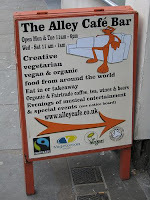 I can’t remember how it was I came to hear about Alley Cafe in Nottingham, or even if it was a happy accident that I stumbled down the small alleyway in which it’s nestled only to be pleasantly surprised. More than a mere eatery, this cafe-come-restaurant-come-bar is a radical vegetarian space. 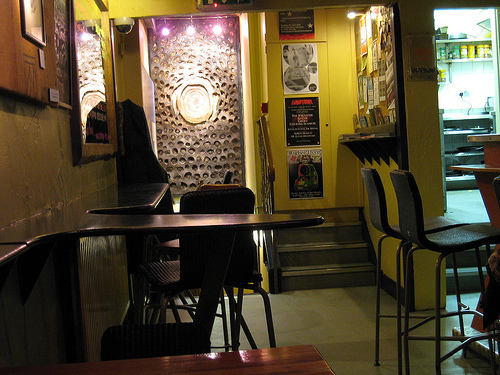 It is an ideal, a cluster of social and political morals bound up into an eclectic space of reggae music, vegetarian food and Green propaganda. 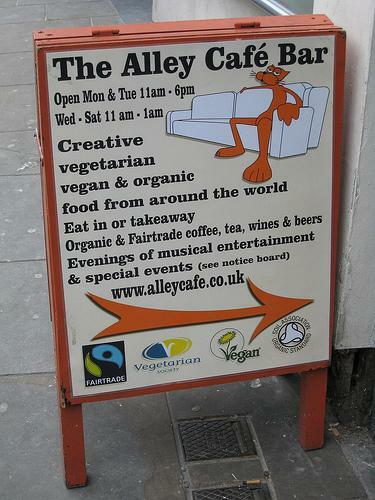 However, for all its political gumption, Alley Cafe is an overtly relaxing place with a laid back atmosphere and communal seating policy (due to its tiny proportions) which could just as easily result in you sitting next to a mother and baby group as an environmental activist. Half of the charm here is the lottery of who you will sit next to, and the amusing and interesting anecdotes they might impart. Communist seating policy aside, the food is impeccable. My favourites include the cooked breakfast – ‘bacon-esque’ included – falafel wrap and bean burrito. You can come here for breakfast, lunch or dinner, with a fiver or a fifty and find something to enjoy and satisfy. A large selection of fresh juices, herbal teas, organic bottled drinks and espresso based treats make choosing what to quench your thirst a full blown dilemma. The staff are warm, welcoming and efficient but don’t expect fast food. The whole experience pivots on the cafe’s laid back charm so expecting your meal in five minutes flat is not only unrealistic but completely misses the point of a visit to such an establishment. A packed community notice board adds bundles of charm and intrigue as you never know what you might find – poetry zine, gallery flyer or vacant flat. Cheers for the recommendation, Claire. Sound like perfect the 4th or 5th date place.